Lady Hawks catcher Madi Townsend attemps a putout at the plate against Tri-County North. After run ruling Union City 13-3, the Lady Blackhawks suffered a set-back the next night against Tri-County North. The roles were reversed as they were shut-down by North 13-0. The Blackhawks had problems generating offense although they scattered some hits during the game, they could not bring their base runners around. On the other hand, North jumped on the Blackhawk’s pitching early. They had not one but two triples in the first inning. In the second inning it looked like the Blackhawks defense was waking up. MV pitcher Taylor Collins caught a line drive for an out and catcher Madi Townsend had a put-out when she caught a foul ball. This held North scoreless in the inning. For the visiting fans, it looked like the team was showing signs of life. It was only 2-0 at this point and a good inning would put the team back in the game. In the top of the third the Lady Blackhawks went down 1-2-3 and any momentum from the previous inning was lost. Instead, in the bottom of the third inning North had back to back doubles as their offense reignited. They ran the bases well and now the game began to get out of hand as they scored four more runs. The Lady Hawks did not mount any challenge in the remaining innings and North added more insurance runs for the easy win. The Lady Hawks had gone from the mountain peak to the valley in just a day. The Lady Blackhawks will next play a league game against Twin Valley South. 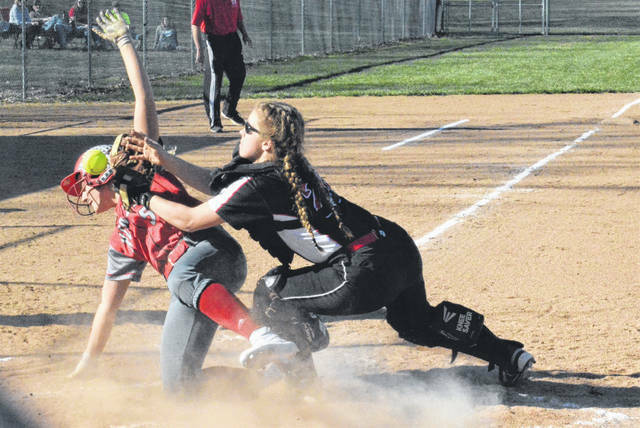 https://www.dailyadvocate.com/wp-content/uploads/sites/34/2019/04/web1_Madi-Townsend.jpgLady Hawks catcher Madi Townsend attemps a putout at the plate against Tri-County North.